JumpFly is excited to share that our Account Director Nikki Kuhlman has been announced as one of only eight finalists for the 2018 Bing Ads Trailblazer of the Year Award. This prestigious award will be presented to an individual who evangelizes Bing Ads and drives Bing Ads brand awareness and affinity in an innovative and engaging way, both internally in their own office as well as industry wide. 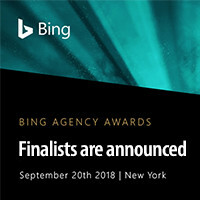 This winner of this award will be honored on September 20, 2018 at the 2018 Bing Agency Awards ceremony held in New York. Nikki was nominated for this award not only because she is a true “Bing Champion”, but also because of her willingness to go outside of the JumpFly organization to form meaningful relationships, spearhead social awareness and have an impact on her community. Her contribution to Bing Ads growth and JumpFly implementation of Bing Ads initiatives helps make JumpFly better for our team and a better management company for our clients. The JumpFly team is looking forward to the 2018 Bing Agency Awards ceremony and celebrating with the most creative, effective and passionate marketers in the paid search industry. JumpFly professionally develops, implements and manages Google AdWords, Bing Ads, Yahoo Gemini and Facebook pay-per- click advertising accounts, enabling clients to maximize Internet advertising results while saving time and money. Proper setup and management of these powerful programs will likely make the difference between an advertiser’s success or failure. JumpFly’s full-service solution enables clients to focus on their core business while achieving the best possible results from their search engine marketing campaigns. JumpFly is a Premier Google Partner, Facebook Certified Partner, and exclusive Bing Elite Agency. JumpFly assists more than 400 clients, offers a money-back- guarantee, ranks as the #1 PPC Management Company by TopSEOs and Clutch, and has an A+ rating from the BBB.